Are we still talking about kale? Has kale jumped the shark yet? Whatever. I don’t think I could ever get sick of greens of any sort. 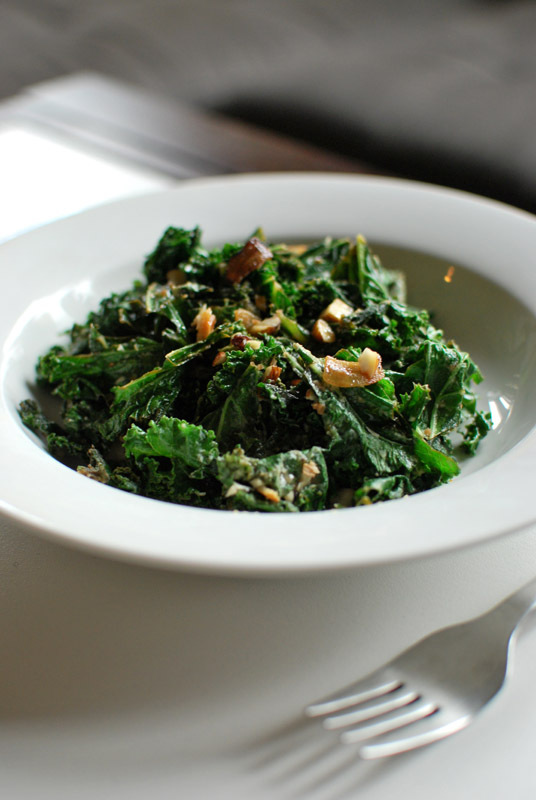 Kale, chard, collards, mustard greens, turnip greens… they just do it for me. Kale in particular has this wonderful texture, much like your workaday cabbage, that’s just as good cooked as it is raw. Passion for kale notwithstanding, this recipe was born out of desperation, as so many of my recipes are. My traditional post-Christmas detox* this year resulted in a steady supply of fresh greens in the fridge, and not much else. Needing protein, I added almonds and tahini. Kale screams for garlic; I obliged. A handful of currants made for a Middle-Eastern sweetness. And I couldn’t help but add some heat via fresh chile. The overall flavor hinted at peanut butter on celery sticks, but way more soigné. It was one of those times where I took a taste, then grabbed a pen and some paper to feverishly try to remember what the hell I did to make it. It’s all slightly al dente kale, nutty tahini, sharp garlic and lemon, jammy currants. It’s flippin’ awesome. *It’s not so much a detox as an “oh god I might actually die unless I eat the most healthy things I can for about three weeks, so fetch me all the kale”. Fixes me right up. I used regular curly-leaf kale, which stayed reasonably al dente in this preparation. This was enough for two light lunches, served with bread and fruit on the side. A drizzle of olive oil over the top is not out of place here. 1. Heat 2 tablespoons olive oil in a large skillet over medium heat. Add the minced garlic and chile; cook until fragrant, 30 to 60 seconds. 2. Add the kale, in batches if necessary, and sprinkle with a pinch of salt. As it wilts, stir to coat with the oil. Cook for about 5 minutes, until softened. 3. 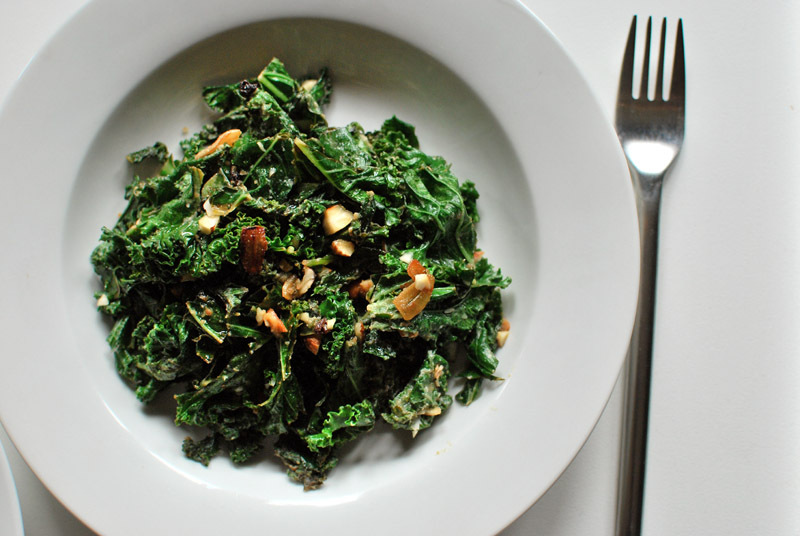 Drizzle the tahini and lemon juice over the kale, and stir to incorporate. Add a spoonful of water if needed to thin the sauce. Heat briefly to warm through, then remove from heat. 4. Stir in the currants and almonds. Taste, and correct seasoning as needed with salt, pepper, and additional olive oil and/or lemon juice. Serve warm.